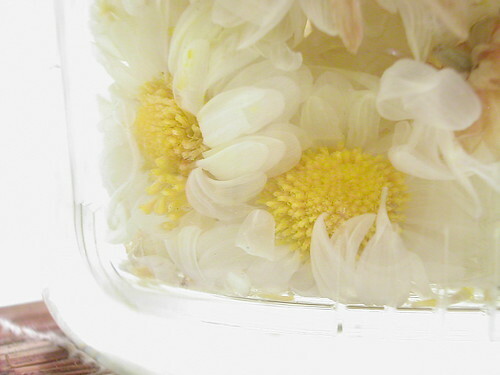 I love chrysanthemum tea, but I don’t like the kind that comes in sachets. My main gripe with them is that they’re usually too sugary. So when I saw bags of flowers in a Chinese herb shop in Monterey Park, I just could not resist. To make this cup of tea, I packed the inner glass sleeve of my new fancy tea mug with dried flowers and topped it up with boiling water. If you have a sweet tooth, I’d recommend a small amount of honey (preferably one that doesn’t have too intense a flavour).